Grease a microwave safe glass bowl (Preferably a square or rectangular bowl) with oil. Take a deep bowl and add gram flour, semolina, salt and sugar. Mix well with a whisker. Take 1Cup chilled soda water in a separate bowl. Add citric acid to the chilled soda water and mix well. 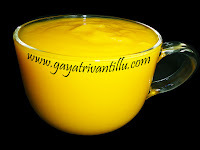 Add this water to the gram flour mixture and mix well with a whisker till smooth without any lumps. Take 1tbsp water and mix baking soda in it. Keep the greased bowl near to the working place. Add the baking soda mixed water to the gram flour mixture and stir vigorously till it becomes foamy. Pour this into the greased mould and place this bowl in a microwave oven. Microwave the Dhokla mixture on high power for 5 to 6 minutes. Remove after 2 minutes standing time. If you find that the dhokla is not cooked at some places microwave again for one minute. Remove the bowl from oven and cool it completely. Once the dhokla is cool, cut it into even sized pieces. Dissolve 1/2tsp sugar in 1/4Cup water. Pour this sugar solution on the dhokla pieces with a spoon so that each piece is filled with sugar solution. They will absorb this water and become like sponge pieces. Heat a pan and add oil to it. When oil is hot add mustard seeds and fry. When the mustard seeds start to splutter, immediately add sesame seeds and fry for few seconds. Add chopped green chilies, curry leaves and asafoetida. Fry well and spread this seasoning on the Dhokla pieces. Toss them gently so that all the pieces are covered with seasoning. Transfer them to 2 serving plates and garnish with grated coconut and chopped coriander leaves. Serve immediately with sweet sour chutney. This is a simple dish which can be prepared in just a few minutes.